Social-emotional skills are widely believed to be more important to effective long-term learning than IQ. Preschool and early elementary is a critical time where targeted social-emotional learning interventions can have the greatest impact on long-term outcomes. The Leader in Me process is an effective social-emotional intervention in Pre-K–12 education. The process has initial research support, suggesting its positive role in improving social-emotional development, even in preschool students. For example, a recently published study in the American Journal of Public Health (2015) examined kindergarten teachers’ ratings of their students’ social-emotional skills (e.g., kindness, sharing, and empathy), and found a significant relationship to adult outcomes such as higher educational attainment, stronger employment, and better mental health, in addition to reduced criminal activity and substance use. In his seminal book Emotional Intelligence, Daniel Goleman unraveled the false notion that social-emotional skills are fixed, and instead suggested that targeted social-emotional interventions can profoundly improve baseline abilities and often have lasting impact years after the initial intervention. In one such study, researchers discovered that social-emotional learning (SEL) intervention programs in kindergarten positively impacted adult outcomes. Specifically, kindergarteners who participated in one of a number of targeted SEL programs had 10 percent (59 percent vs. 69 percent for the control group) fewer psychological, behavioral, or substance-abuse problems at the age of 25. Together, these findings suggest that even short-term early childhood interventions, which enhance the development of social-emotional skills, can have long-lasting impacts on a child’s future. As an effective social-emotional intervention, The Leader in Me is able to offer similar impacts on the developmental and academic trajectories of students in preschool and early childhood. A preschool study, conducted by Dr. Loreta Anderson of St. John’s University (2011), offers initial research evidence specific to this age group. Trained researchers and teachers used a standardized scale to rate the students on their social-emotional abilities before and after a seven-week time period, where one class received a Leader in Me intervention that included the 7 Habits and leadership lessons, and the other class had no intervention. Dr. Anderson found The Leader in Me process was related to an increase in preschool students’ observable, positive social skills and effective leadership habits. She found both independent and interdependent behaviors of the students increased after the lessons, with interdependent skills enhanced the most. 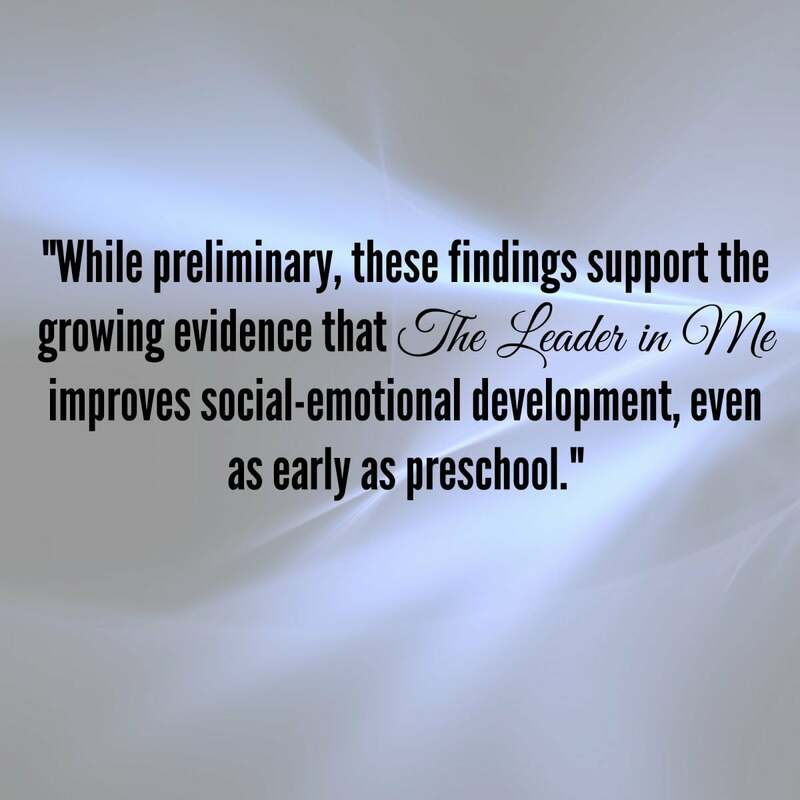 While preliminary, these findings support the growing evidence that The Leader in Me improves social-emotional development, even as early as preschool. Shore, R. (2002). What Kids Need. Boston: Beacon Hill. (Measelle, Ablow, Cowan, & Cowan, 1998). Hyson, M. & Tomlinson, H. (2014). The Early Years Matter: Education, Care, and the Well-Being of Children, Birth to 8 (Early Childhood Education). New York: Teacher’s College Press. Jones, D. E., Greenberg, M., & Crowley, M. (2015). Early social-emotional functioning and public health: the relationship between kindergarten social competence and future wellness. American Journal of Public Health, 105(11), 2283–2290. Goleman, D. (1995). Emotional Intelligence. New York: Random House. Dodge, K. A., Bierman, K. L., Coie, J. D., Greenberg, M. T., Lochman, J. E., McMahon, R. J., & Pinderhughes, E. E. (2014). Impact of early intervention on psychopathology, crime, and well-being at age 25. American Journal of Psychiatry, 172(1), 59–70.